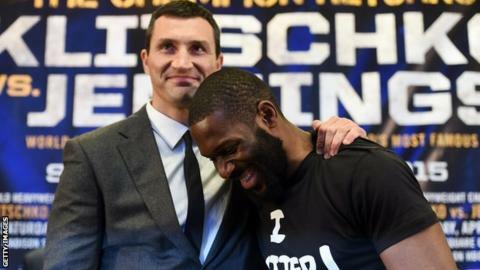 World heavyweight champion Wladimir Klitschko has performed his own song for opponent Bryant Jennings ahead of their Saturday fight. Klitschko, 39, posted the song on social media to taunt the unbeaten American before they meet at Madison Square Garden. The Ukrainian is putting four belts on the line against Jennings, 30. But the WBA, WBO, IBF and IBO champion looked relaxed as he sang "bye bye, hit the road Jack" while seated at a piano. Earlier, Klitschko said: "I'm confident I will win this fight. I am confident I will defend my titles." His 27th title fight will see him match a heavyweight record set by Joe Louis. Jennings has won all 19 of his fights - but Klitschko is also unbeaten in his last 19 bouts. However, former maintenance worker Jennings said: "I've been confident from the beginning. "I'm not intimidated. I know what he is in for. This is the life, boxing, that I signed up for."